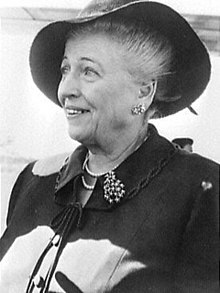 Pearl Sydenstricker Buck (Juin 26, 1892 – Mairch 6, 1973; an aa kent bi her Cheenese name Sai Zhenzhu; Cheenese: 賽珍珠) wis an American writer an novelist. As the dauchter o missionaries, Buck spent maist o her life afore 1934 in Zhenjiang, Cheenae. Her novelle The Good Earth wis the best-sellin feection beuk in the Unitit States in 1931 an 1932 an wan the Pulitzer Prize in 1932. In 1938, she wis awairdit the Nobel Prize in Leeteratur "for her rich an truly epic descriptions o peasant life in Cheenae an for her biografical masterpieces". She wis the first American woman tae win the Nobel Prize for Leeteratur. This page wis last eeditit on 15 Apryle 2017, at 16:59.